Microbial control of bark beetles – Can it be effective? The spruce bark beetle, Ips typographus, is the most destructive insect pest of spruce forests in Slovakia. At present, its populations are very active and characterized by massive outbreaks with continual establishments of new foci over large areas of spruce forests. Control of bark beetles is based on a range of phytosanitary measures, insecticide treatments of trunks, and pheromone trappings. A specific issue arises in no intervention zones or nature reserves, where those control measures are prohibited. In such areas, therefore, effective ecologically friendly techniques are required. Researchers from the Institute of Forest Ecology SAS have focused their research on microbial control of this pest with special attention to entomopathogenic fungus Beauveria bassiana. The fungus is a common natural parasite of insects, including bark beetles, and can help in prevention of formation population outbreaks. In collaboration with researchers from the Institute of Zoology SAS and the Polymer Institute SAS, they have been testing a polymeric matrix, chemically based on a thermal modification of low-molecular polyethylene, for effective immobilization of B. bassiana spores. Spores in the matrix can be combined with pheromone traps modified for autoinoculation of lured bark beetles. Beetles contaminated with spores are expected to leave the traps, horizontally spread the fungal infection into the bark beetle environment, and finally die from fungal infection. 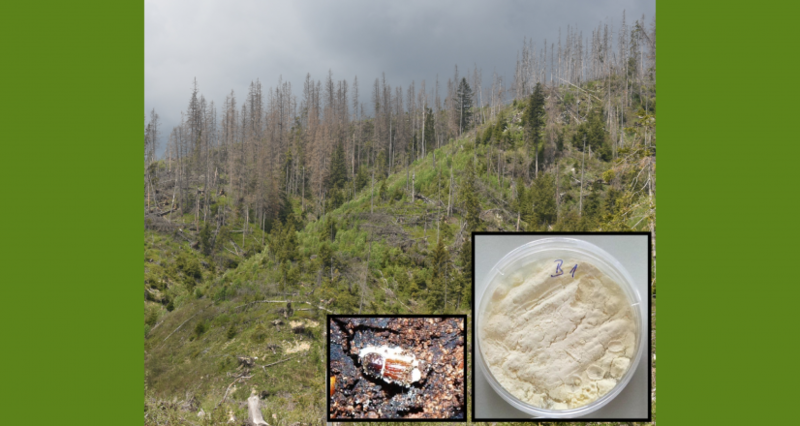 Optimistic outcomes of laboratory assays, recently published in Biocontrol Science & Technology, demonstrate potential of this polymeric material for its use in microbial control of bark beetles when mixed with conidia of B. bassiana.